I want to take this opportunity to thank everyone who's shown an interest in my book, 'A Model's Guide to Losing Weight Without Dieting.' Thank you also for your support and feedback. Your input means a lot to me. 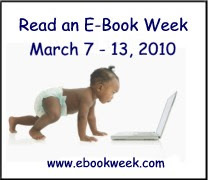 As some of you may know, March 7-13 is Read an e-Book Week on Smashwords. To celebrate this, authors all around the world have been invited to sell their books at a discount or completely free! I'm participating in this event and have cut the price of this book by 25% (details below). To read more about 'Read an e-Book Week, take part in competitions, or snap up free e-Books and guides, go to their official site where there's a wealth of information, interviews and articles. To buy 'A Model's Guide to Losing Weight Without Dieting' for $3.99, please go to my Smashwords profile. Don't forget that this book is also now available in hard copy at lulu. Thanks again to all who've read and enjoyed this work. That's generous of you, Anne..Wish you all the luck!